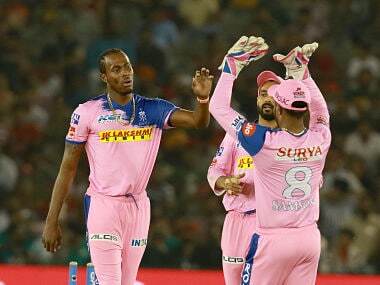 Two overs later, Archer was into the attack himself and in his second over, was left fuming after Sanju Samson fumbled and conceded four byes with Gayle being beaten on the edge. Steaming in next ball, Archer found Gayle’s edge through to the keeper and celebrated the wicket of the Universe Boss. In the 17th over of the innings, Archer, Rajasthan’s strike bowler until then, came around the wicket and cleaned up David Miller with a pacy delivery on the stumps. However, drama unfolded as the umpire signalled a front foot no-ball almost immediately. Ashwin crunched the first ball he faced past point for a boundary in the final over. Off the penultimate ball of the innings, he picked Kulkarni’s slower variation and sent the ball into orbit with a massive swipe across the line. Next ball, he was walking across the stumps, having predicted the yorker, and scooped the low full toss over fine-leg for another maximum. In four balls, Ashwin added 17 runs and took Punjab to an above par score. In hindsight, his cameo proved to be the difference between the two sides.